HOLLAND, Mich. (May 09, 2017) — The Center for Positive Organizations has been working since 2002 to conduct research that shows how inspiring and enabling leaders to build high-performing organizations brings out the best in people. Elzinga & Volkers, a leading West Michigan construction company, today announced that the organization has been honored with the 2018 Positive Business Project Communications Toolkit Gold Award from the Center for Positive Organizations at the Ross School of Business at University of Michigan. The finalists were chosen based on how well their practice aligned with positive business, the practice’s impact and the ability of the practice to be replicated in other companies. 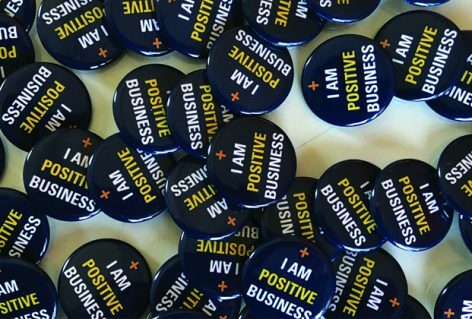 Submissions were judged by a four-person panel comprised of faculty from the Center for Positive Organizations, University of Michigan student fellows and business leaders who have implemented positive business practices in their own organizations. E&V’s award winning corporate mapping program was created by the E&V executive team as a thesis project from an innovative management program. The goals of the program are to simplify communication of corporate vision and goals to create a platform for employees to connect directly with the company’s goals. The first step in the mapping process was the consolidation of a fifty-page fiscal year business plan into five Business Plan Maps (BPMs), representing the five core focus areas of the company: financial, marketing, general overview, operations and employee care. The next level of mapping is the division maps. Division maps clearly define departmental goals to ensure that all team members work toward a common goal. Lastly, the third side of the mapping triangle is the uMaps. Using the Business Plan Maps and Division Maps as a guide, each employee develops a uMap that helps them to outline their role in the company and decide how they can best help themselves, co-workers and the company find success. uMaps also have an area for employees to share familial and personal goals, allowing leadership the opportunity to offer encouragement and support for employees lives outside of the office. their uMaps and set realistic goals for themselves that align with the organization. Through this process, E&V employees have developed a stronger connection to the organization as well as an understanding of where they fit in as an individual. The organization is thankful to The Ross School of Business and the University of Michigan for recognizing these continued efforts. The Platinum and Gold Awardees were recognized main stage during the sold-out 2018 Michigan Ross Positive Business Conference on May 10-11, 2018 in Ann Arbor, Michigan.